Notre Dame drops another game this past week to NC State. Hurricane Matt showed his presence Saturday with downpours of nonstop rain. Several turnovers and lack of offense was the case in the game. 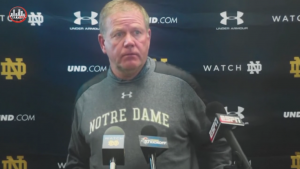 This week we have Notre Dame twice published author Lisa Kelly from St. Louis on as a guest and Coach Brian Kelly post game comments. Also, a big announcement about our Nov. 7th show at www.nineirishbrothers.com.